A $22 candle from Prosperity Candle brings you more than light and a gentle rose coriander scent (if you choose). It comes with the first name of the woman who made it and an identifying number that allows you to send her comments and feedback. 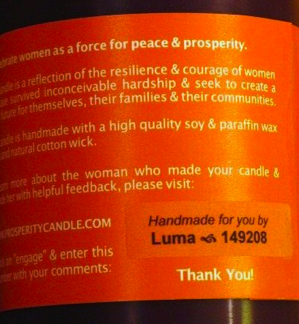 The woman who made your candle lives in Baghdad and was one of 44 participants in Prosperity Candle’s pilot program to empower women in regions of conflict and disaster. Through more shipments of a candle-making business-in-a-box, partnerships with local organizations and video Skype candle-making demonstrations, Prosperity Candle plans to help 1,000 women establish candle-making businesses in Iraq, Haiti and Rwanda by 2014. Click the player to listen to my conversation with Ted, which goes into detail about how he launched operations oversees and why he choose to become incorporated as an L3C. Right-click and save for the MP3. Prosperity Candle is a for-profit social venture with L3C legal status (a Low-profit Limited Liability Company combines the financial advantages of an LLC with the social advantages of a nonprofit). 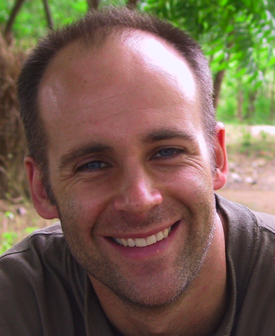 Ted Barber and his co-founder Amber Chand spent several years exploring the optimal product or service that could be used to create a business model they called Shared Prosperity, which gives every woman a regular and transparent share in profits. They settled on candle-making (after extensive at-home tests) because it’s a highly scalable craft that requires only incremental investment in low-cost equipment (in this case, the wax molds). For $140 an Iraqi woman can purchase a kit complete with the materials and equipment for candle-making, as well as an extensive entrepreneurship guide that covers record keeping, steps for starting a business and attributes of a successful entrepreneur. Working with its core partner Women for Women International, Prosperity candle subsidizes the cost of the kits and additional wax molds; a new partnership with a microfinance provider now enables the women to buy materials on credit. The entrepreneurs are paid $5 for every exportable candle when they bring their products to their local collection branch, run by Women for Women. The entrepreneurs can produce one candle per mold per day, which, at one $5-candle per day, allows a woman to receive more than double the average hourly wage. After selling eight candles, a woman can invest in a new wax mold and double her output and income. On Prosperity Candle’s signature components is the interaction between consumers and the entrepreneurs. “It’s a rare instance when [an entrepreneur] is able to sell her product across the world and have a [consumer] talk directly to [her]. It’s had a tremendous impact on the women’s…sense of self esteem, of being connected to the world, of not being isolated in Baghdad…. It’s a powerful experience for them to realize that this isn’t just a project taking place in Baghdad, but that it’s a long-term opportunity for them and that they now have customers,” says Ted. Like this interview? You can thank Ted on Twitter like this and follow him at @WomenProsper.